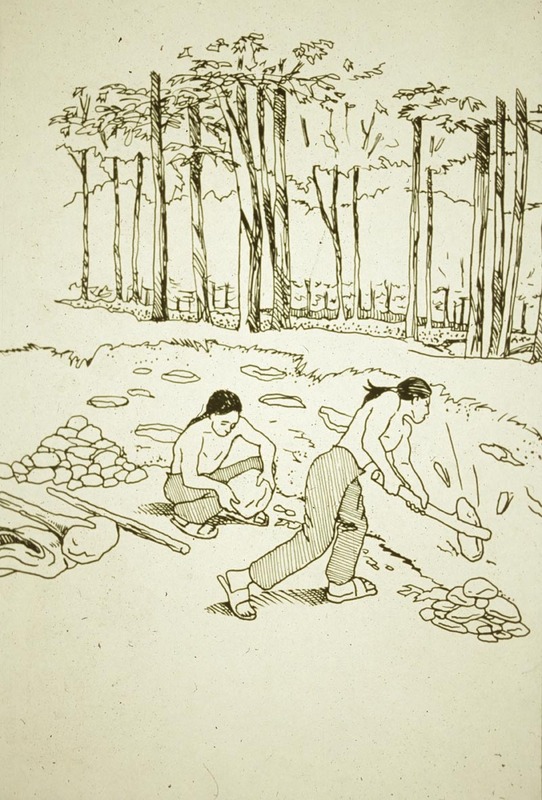 Drawing depicting Native Americans excavating lithic materials from a quarry. The production of stone tools dates to 2.6 million years. By the time our ancestors arrived in Pennsylvania, at least 16,000 years ago, they had mastered this technology and were using relatively sophisticated flint knapping techniques. 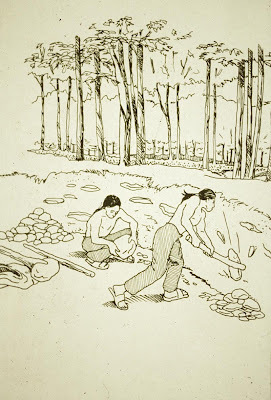 During Paleoindian times (11,150 to 10,000 years ago), these early inhabitants in Pennsylvania quickly discovered the best quality stone for tool manufacture, preferring cherts and jaspers. Paleoindians frequently traveled well over 200 km to obtain the highest quality material in the region. Metarhyolite and quartz were added to the list of preferred lithic materials for chipped stone tools during the Early Archaic period (10,000 to 9000 years ago). 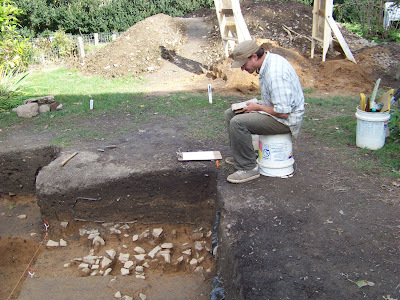 By Middle Archaic times (9000 to 6000 years ago), there did not seem to be strong lithic preferences and Native Americans used a variety of materials that were available locally. This trend lasted until the Transitional period (4000 to 3000 years ago) when there was a return to a very strong lithic preference for jasper, metarhyolite and argillite. These three lithic types are all found as bedrock sources in Pennsylvania and were traded throughout the Northeast and Middle Atlantic regions. Interestingly, after the Transitional period, there is a return to mainly the use of local lithic materials. Pennsylvania contains some of the best stone for tool production in the Middle Atlantic region and some of this material has been used for over 11,000 years. When Native Americans first arrived, high quality lithic materials were probably exposed on the surface in bedrock outcrops or as boulders. Lithic quarries represent the earliest preserved industrial sites. Prehistoric lithic quarries are spectacular for their shear quantity of artifacts and they attracted a great deal of attention from professional archaeologists in the late 19th century. However, they are very difficult to excavate because in 11,000 years of digging, the artifacts from different time periods have a tendency to become mixed. Different techniques were used to extract the stone for tools and early Native Americans demonstrate a surprising knowledge of geology. Quartzite and quartz are usually available on the surface of the ground. In this case these “quarries” were simply large areas where the material is slowing eroding out of the bedrock. The recovery of suitable material did not require much effort and therefore not many artifacts were left behind. Many of the cherts in the Ridge and Valley physiographic zone were found in thin layers (four to twelve inches thick) and were extracted from the bedrock using levers, wedges and stone hammers. The remains of these kinds of activities were minimal and relatively speaking, there are few artifacts at these sites. The Catoctin metarhyolite in South Mountain (Adams and Franklin counties) was originally (800 million years ago) a lava flow but was folded in a mountain building episode about 300 million years ago. In some cases the folding process improved the stone’s quality for making tools and in other cases, it ruined the stone for use in tool manufacture. In addition, surface exposed metarhyolite dehydrates and the flaking qualities are reduced. Clearly, Native Americans excavated for good quality material and the quarries are characterized by many small, saucer and cone shaped pits covering many acres of ground. The pits are usually less than eight feet in depth and twenty feet in diameter. They include huge quantities of low grade material ordinarily discarded at the quarry; hammerstones were very large to small in size as were stone hoes used as digging implements. Quarry pits were subsequently filled in as adjacent areas were quarried. Tree throws and erosion often completed the filling of these pits, leaving barely perceptible depressions. Today, the quarry pits show up as small depressions that have been backfilled prehistorically by the excavation of adjacent pits and historically by erosion. Snaggy Ridge Quarry in Adams County. The Hardyston jasper in Berks and Lehigh counties was formed by the earth’s pressure on sandstone and quartzite. Jasper forms in large irregular masses, covers several acres in extent and sometimes over 40 feet thick. It was concentrated in a limited space and thus very highly desired by Native Americans for stone tool manufacture. After the surface jasper was used, probably during Paleoindian times, Native peoples dug for the material. Based on excavations conducted by PHMC archaeologists, some of the quarry pits investigated were found to be over twenty feet deep and at least 80 feet in diameter. 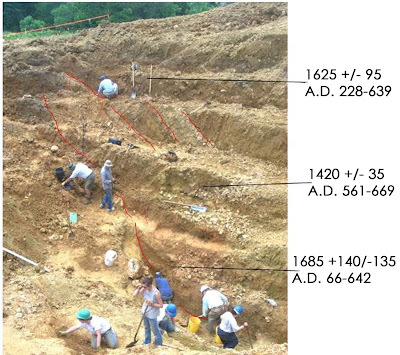 At the Kings Jasper Quarry (36Lh2) in Lehigh County, Paleoindian artifacts were found at the surface next to a quarry pit that after archaeological excavation proved to be twenty four feet deep. A number of charcoal samples were collected from a sloping layer of jasper that indicated a stable surface within the quarry pit when it had reached its maximum depth. The dates assessed to approximately 1600 years ago. This photo depicts the profile of a 24 foot deep Native American dug pit at the Kings Jasper Quarry site in Lehigh County. The carbon 14 dates mark a relatively stable, steeply sloping surface created after the pit began to backfill. This occured due to natural processes and probably additional Native American quarrying activities in adjacent pits. In the prehistoric world, stone quarries were special places and high quality stone had a spiritual value. Based on ethnographic studies, special ceremonies were conducted at quarries. Deep holes were frequently thought of as entrance ways into other worlds. All religions serve, in part, to explain their surrounding world. In the Stone Age mind, quarries were probably indistinguishable from the creation stories that explained their origin. 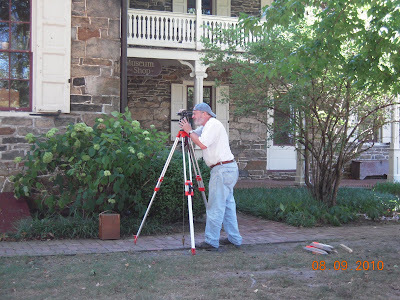 On February 10, Dr. Kurt Carr of The State Museum, Section of Archaeology, will give a presentation to the Harrisburg Area Geological Society/Association of Engineering Geologists. The meeting will be held in the GTS building on Friendship Road, just past the Bass Pro Shop at 7:00 pm and is open to the public. This presentation will review the major quarries in Pennsylvania used by Native Americans, focusing on the jasper quarries in Lehigh and Berks counties and the metarhyolite quarries in Franklin and Adams counties. This week’s blog was written by one of our new volunteers, Shelia Dunn, who started in our lab after spending this fall volunteering on the excavation at Fort Hunter. Location, location, location are the first three words I remember hearing early on at the dig at Fort Hunter. 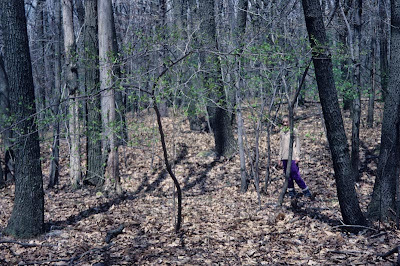 Location is the most important aspect of a dig. Having observed several "digs” as shown on television programs you see people on hands and knees, with a trowel in hand very carefully scraping a sliver of material away from an object. Watching them using a brush to carefully expose a surface of a piece of bone, or glass, or pottery, or possibly an arrowhead that had laid in that spot for hundreds or thousands of years is exciting – a historic moment in time and space. But what does it mean? Two more words – Human activity. Human activity is apparent if objects are found like the ones mentioned above, then the fun begins for the archaeologists. The value put on the objects found is something money cannotbuy – it is our very own history. It is not the monetary value of the objects that is important but the picture that begins to unfold -like detectives solving a case, these archaeologists go to work putting the pieces together. So what is the next step? Establishing the datum point and setting the grid for excavation. The excavation begins with the placement of a grid to map the horizontal location of artifacts and a datum is established to measure the vertical location of artifacts. As the dig progresses, the objects that are exposed are mapped on level sheets and elevations are taken on each object. Once every object has been documented they are collected in bags and each bag is marked with the site, grid coordinate, level, date, and initials. . Daily logs are also kept to document progress and other significant information. Photo documentation occurs in the field before the objects are removed showing the location, date, and site number, sometimes using a very tall ladder. The bags are moved to the lab, entered into a database, washed and cataloged. In the lab, each artifact is assigned a catalogue number which represents a “code” for its location or provenience. Sheila washing artifacts in the archaeology lab. So, with trowel in one hand and a kneeling pad, bucket with a tape measure, paint brush, dust pan and brush, spoon or other small tools to remove material, I descend down the ladder into the dig to very carefully remove material into the dust pan and then a bucket. Taking the bucket to the screens and putting any flakes, pieces of pottery or glass into a marked bag. Some objects are pedestaled until the 3” level is excavated. Every object is documented, photographed, and bagged before a new level is started. FCR, (fire- cracked- rock) is common on this site and for the novice (me) can be a challenge not to step on or worse. Mapping and recording FCR prior to removal. After a good night’s sleep everyone is back and eager to again descend onto the dig. With trowels in hand we carefully proceed, waiting to see how the next object will add to and enrich the untold story of Fort Hunter through the artifacts and evidence of human activity. In honor of Pennsylvania Farm Show week we thought we would take this time to feature a Pennsylvania farmstead site. As you might imagine farmsteads are a common site category in Pennsylvania. We will focus our attention on just one farmstead, the Koch/Schmoyer farm in Lehigh County excavated in the late 1990’s by McCormick, Taylor and Associates, Inc. 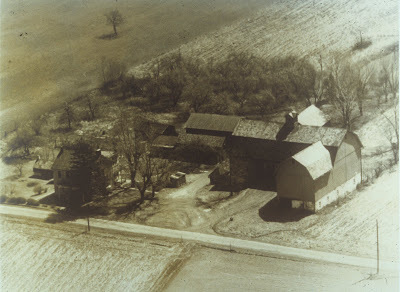 It is a great example of a Pennsylvania German farm occupied from the 18th and into the 20th century. Farmsteads were not stagnant entities, they evolved and changed over time. The Koch/Schmoyer farm exemplifies the evolution of farmsteads through early techniques of crop farming and animal husbandry toward modern farming practices, thus transitioning from a self sustaining farm to a market based farm. This familiar trend is present as farms progressed from a small dairy, to a cottage butter industry, to eventually selling raw milk to a dairy cooperative in the 20th century. Much of this development is illustrated in the configuration of the outbuildings on the farm. Census records also demonstrate this change through equipment and livestock counts. Archaeology revealed the presence of a ground cellar at the location of the original spring that included a drainage system. The combination of these features suggests its use as a milk house. Because butter did not spoil as quickly, it was found to be more profitable than marketing fresh milk. The coolness of the subterranean ground cellar coupled with the fresh spring water would have created an environment to prolong the life of the butter until it could be distributed. 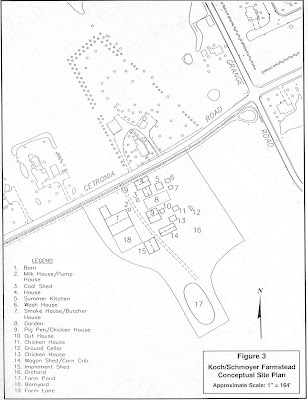 Another example of the progression in farming techniques was the relocation of “odiferous” livestock far away enough from the house to minimize the smell but close enough that the animals could be monitored. The farmyard configuration can also speak to some degree to the ethnicity of farmers. It is said that German farmers were more inclined to provide better shelter for their animals through the cold winter months, thus larger barns and pens. Historically it was noted that the Pennsylvania German farmers “always provide large and suitable accommodations for their cattle before they lay out much money in building a house for themselves”, Benjamin Rush 1787. This reduced the amount of feed needed for the livestock. The English, Scottish and Irish tended to allow the animals free range of the farm. As farming practices changed from subsistence to market based, the economic level of the farm grew. This growth is visible in both the domestic wares used within the house as well as the machinery used in the daily workings of the farm as listed in the historic records. The Gackenbach’s were occupants of the Koch/Schmoyer farm from 1833-1844, and the daily wares attributed to them appear to be contemporary styles for the day, shell edged pearlware with polychrome decorations. These tablewares while not extravagant would have been more decorative than the average plain wares of the time and much more decorative than the utilitarian redwares used by the previous occupants, Weaver/Sorbers (1774-1833). Since we were unable to be at the Farm show this year let this serves as a tribute to our great heritage of farming in Pennsylvania. We have missed you this year, but with any luck we’ll see you at future shows. If you would like to let Farm show officials know we were missed, you could send a comment or a tweet to the Farm show website. For many this past weekend, the New Year celebration included the iconic champagne flute to ring in 2011 with a splash of bubbly. What is it about the shape of a wine glass, or stemware in general, that carries with it a particular sense of style, even an elegance of form. A quick search of Eureka Encyclopedia lists no fewer than twenty different styles of stemware. The diminutive tumbler or a standard glass mug really lacks an air of sophistication by comparison. Once a status symbol reserved only for the well-heeled, stemware is now everywhere. 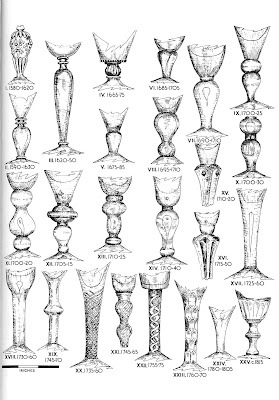 Ivor Noel Hume's A Guide to Artifacts of Colonial America includes an illustration (Fig.64, pg.191) of wine stems and provides periods of manufacture for what he calls, "the most datable part of any glass. . . the most substantial. . . and best preserved when found on archaeological sites"(pg.189). The reconstructed stemware seen below was recovered by State Museum archaeologists from the Fort Loudon historic site, 36Fr107, and is currently on display in the PHMC excavation exhibit case in the Anthropology and Archaeology Gallery of the State Museum next to the Capitol building in Harrisburg. Referencing Noel Hume, this particular style of air twist decoration of the stem has a date range between the second and third quarters of the 18th Century. 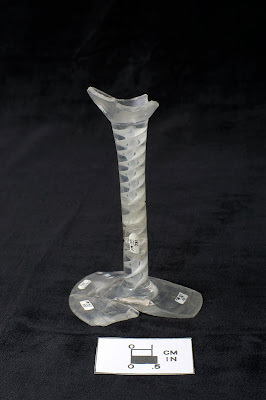 The range of styles and manufacturing techniques employed make glass objects some of the best time markers on a historic site. For many forms of glassware, it is possible to narrow a window of manufacture and subsequent use down to as little as ten years. Still other glass objects have identifying maker's marks that can pinpoint the very year a particular piece was made. Created and maintained by Bill Lindsey, formerly of the Department of the Interior's Bureau of Land Management, extensive reference pages detailing a myriad of glass bottle styles and manufacturing techniques to assist in identification and dating can be found on the Society for Historical Archaeology's website. The presence of pontil scars, mold seams, their number and position, and lip or finish treatment all yield clues about the manufacturing process and serve to aid in the dating of glass objects. Glass assemblages abound in the holdings of the State Museum's Section of Archaeology. Certainly window glass figures prominently on historic sites, as does the ubiquitous, utilitarian Mason jar, in a variety of its own styles. More infrequent though are examples of wine glasses/goblets, or stemware, a subset of the more broadly defined "vessel" glass intended to encompass the gamut of glass table wares. Absent hard-nosed statistical analysis of this specific class of artifact, across a representative sample of sites, hypotheses that incorporate stemware as an infallible indicator of heightened socio-economic status should be relegated to the anthropological waste bin of cliched over-generalizations.